Pearls of Wisdom on how to evaluate pearls, spot fakes and detect dyed pearls. Included in this full-color guide are tips on pearl care, clasps, and creative ways to wear pearls. All types of pearls are discussed–Akoya, Tahitian, South Sea, Sea of Cortez, freshwater, abalone, scallop, conch, melo, quahog, giant clam, mabe, blister, keshi, natural, imitation, cultured. Initially published in 1992, the Pearl Buying Guide was the first book to give consumers details on judging pearl quality and value. The 186 new color photos in this updated 6th edition show new types of pearls, clasps and jewelry styles. Current information has been provided on natural pearls, treatments, cultivation and identification techniques. Although technical data is included to aid gemologists in detecting treatments and identifying pearls, the easy reading style and the 364 photos make this a customer-friendly book for both consumers and professionals, If you’re looking for an easy-to-read, illustrated and affordable pearl handbook that will help you select flattering pearls and spot fakes, the Pearl Buying Guide 6th Edition is the best choice available. * Expanded chapter on "Creating Unique Pearl Jewelry with Colored Gems." Pearl quizzes in the previous editions are posted at http://reneenewman.com/quizpearl.htm. Newman’s updated edition (first published 25 years ago) brings clarity and wit to a challenging subject. As a “buying guide” of course this book focuses on what you need to know to safely buy pearls (or maybe just to admire them). The important price factors are treated in detail, with an entire chapter for each. These include luster and nacre thickness (nacre is the iridescent outer pearly coating), color, surface quality, and size and shape. The numerous types of pearls are covered in detail, including how they form and the many different oysters (and a few other mollusks) they come from. The difference between cultured and natural pearls is carefully explained (not that you can expect to encounter many of the latter: a 21-inch strand of natural pearls sold at Sotheby’s in 2014 for close to $3 million). Freshwater pearls, South Sea pearls, and black pearls each receive their own chapter. The critical subject of pearl color is well treated, including the important effects of lighting. Throughout the book numerous color photos illustrate every point. Of course any gem as valuable as pearls will invite imitations. There’s an entire chapter on how to detect them, armed with nothing more than your loupe. Another chapter shows versatile ways to wear pearls, and you’re almost certain to pick up some new ideas. There’s even a chapter on clasps. And since pearls are more delicate than most gems there are helpful hints on caring for them. This reviewer’s interest in pearls was sparked by the chance find, at a Chinese restaurant, of a small pearl in my Oyster and Ginger Soup. I soon realized how complex the subject of pearls can be. But Ms. Newman’s book takes away much of the mystery. If you plan to venture forth into the pearl marketplace your first purchase should be this book. 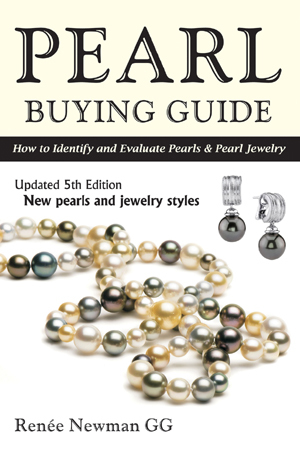 After working in the gem and jewelry trade for over 25 years, I am happy to have Renee Newman's Pearl Buying Guide available. It is full of thorough, accurate and vital information on all aspects of the pearl market and trade breaking down the many varieties of pearls with information pertinent to the consumer at large, and the jewelry professional. Easy to read, full of illustrative photos - it is the real deal for understanding pearls as a consumer or a fine jewelry salesperson. "Peppered with 321 (207 of them new) beautiful photos, the book is typical of Newman’s attention grabbing style. This updated edition boasts more information on freshwater pearls, natural pearls and rare, and expanded chapters on "Curious facts about Pearls" and "Creating Unique Pearl Jewelry with Colored Gems". There is also a brief new chapter on antique pearl jewelry—just enough to whet one’s appetite! All types of exotic pearls are discussed. . . .
There’s not much you won’t find about pearls in this book, save a thought for the humble mollusc. It is a valuable guide to buying all types of pearls and small enough to take on any buying trip. There are price tips, plus recommendations of pearl testing labs and relevant websites." ". . . Everything is covered here [in the Pearl Buying Guide: 5th Edition] and nothing is left to the imagination. For example, sharp photos clearly show the difference in quality between pearl grades, all the way from lustrous beauties to pitted ugly ducklings. And color receives a thoughtful examination, something often overlooked in a world where consumers have been programmed to think white, when they think pearls. New with this edition is a quick tour of pearls in antique jewelry and the addition of several natural pearl types. Photos from her recent trip to China illustrate a working pearl farm and show a wonderful example of the many natural colors that can come out of just one mussel. Renée has expanded and enhanced major portions of the information, making this a significant update from the last version. Although it does not contain pricing, it should be of interest to both consumers and professionals. Personally, I am always forgetting the lengths that correspond to "Matinee" and "Opera" strands (20–26" and 28–36"), so from a reference standpoint, the many tables are highly useful. Renée’s text is very accessible, and her lavish use of outstanding photographs makes it an enjoyable read. There are 207 new color photographs and the examples of pearl jewelry run from elegant simplicity to the truly remarkable. One of my fellow pearl aficionados gave it her ultimate compliment—she called it "fine pearlnography"! The cover and layout are elegant—despite the density of information within—making this book an especially appropriate tool to use in jewelry sales or with appraisal clients. "If you’re thinking of investing in pearls, invest $20 first in the "Pearl Buying Guide by Renée Newman. Even if you already own pearls, this book has good tips on care and great ideas on different ways to wear pearls." "With loads of photos to illustrate her points, Newman tells readers how to check a pearl’s luster, nacre, color, and flaws…a gem-dandy guide to picking right-price pearls." "An interesting and easy-to-understand guide to buying, evaluating, selecting and caring for pearls and pearl jewelry. The opening chapters point out common mistakes made when buying pearls. 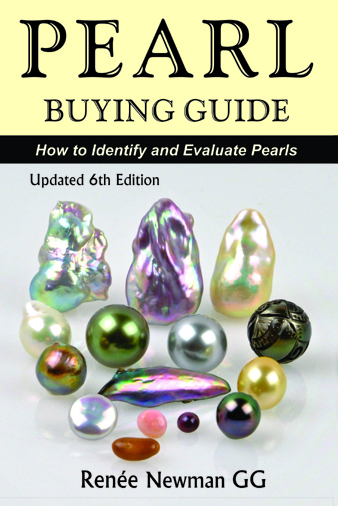 Other chapters focus on evaluating pearl types and shapes, luster, nacre thickness, color, flaws, size, and make. Additional chapters cite differences in South Sea, black, and freshwater pearls as well as imitation, natural and cultured pearls. The closing chapters highlight the proper way to care for pearls as well as creative ways to wear them. The many photographs are valuable in illustrating the characteristics of and differences among pearls. Overall the guide is useful to all types of readers, from the professional jeweler to the average patron." This is the book to get whether or not you intend to buy pearls. It is also ideal for examination preparation! Matters which can seem rather confusing when studied in the abstract are clarified by the many photographs, and the questions set for each chapter are excellent ways in which to test your knowledge. In more than one place the author states that to all intents and purposes, any pearl likely to be encountered in general commerce is going to be cultured. This is an interesting point and almost certainly true. "A well written, beautifully illustrated book designed to help retail customers, jewelry designers, and store buyers make informed buying decisions about the various types of pearls and pearl jewelry. The photos are abundant and well chosen, and the use of a coated stock contributes to the exceptional quality of the reproduction. Consumers also will find this book a source of accurate and easy-to-understand information about a topic that has become increasingly complex." "Newman explains how to appraise and distinguish among all varieties of pearls. She takes potential buyers and collectors through the ins and outs of the pearl world, and her guide will best serve those looking to make a considerable investment. She explains why buyers might favor one pearl type over another and how to shop for pearls (e.g., examine the strands on a flat white surface, look at the light reflections on the pearls, etc.). A chapter on versatile ways to wear a strand of pearls offers looks reminiscent of 1920s flappers, Jackie Kennedy and Vegas showgirls. Newman also shares a brief, "unconventional" account of the pearl throughout history, written from the point of view of "The Pearl Family" ("we pearls regret the discomfort we cause to [oysters and mussels] when they are alive"). Quizzes in the back of the book will allow readers to test their knowledge, and copious color photographs enhance the workmanlike text. it educates a buyer in need of education. The author has done a tremendous research job." "An easily read, interesting, and helpful book on pearls...This book would be a good starting place for a jewellery clerk wanting to improve his or her salesmanship, and would even be a help for a graduate gemmologist seeking a better understanding of what to look for when examining or appraising a pearl necklace."